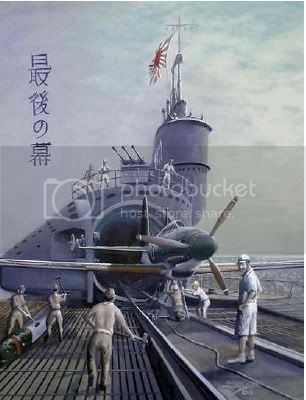 His Imperial Japanese Majesty’s “Sensuikan Toku” HIJMS I-400 [Special Submarines]. Designed specifically to attack the Panama Canal. JAPAN’S SUBMERSIBLE I-400 AIRCRAFT CARRIER in many ways was decades ahead of her time. She was the world’s largest submarine with a length of 400-ft and a surface displacement of 3,530 tons. Above her main deck rose a 115-ft. long, 12-ft diameter, hangar housing three torpedo-bombers. and capacious fuel tanks that gave her a range of 37,500 miles: One and a half times around the world. 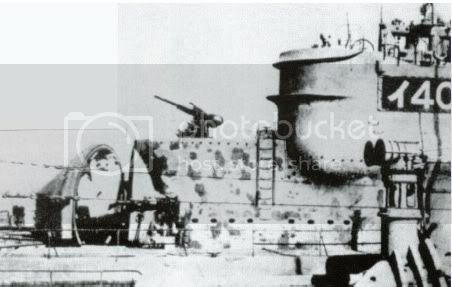 She was armed with eight torpedo tubes, a 5.5-in 50-cal deck gun, a bridge 25mm antiaircraft gun, and three triple 25 mm A/A mounts atop her hangar. The advent of guided missiles and atomic bombs would have transformed her from dinosaur to an over specialized undersea menacing strategicthreat. and it was specifically intended to destroy the U.S. controlled Panama Canal. 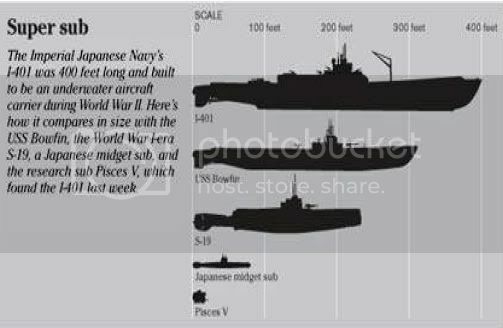 A fleet of 18 boats was planned in 1942, and work on the first one was started in 1943 at the Kure, Hiroshima arsenal. Within a year the plan was scaled back to five, and four (I-400, I-401, I-14 and I-13) were completed. 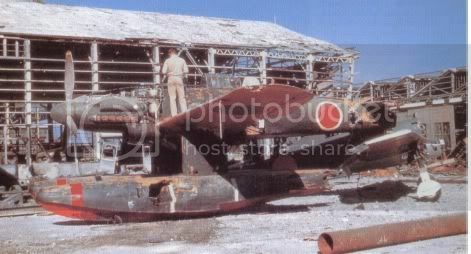 The I-400's had aircraft storage and catapult for three M6A1 Seiran (Storm from a Clear Sky) torpedobombers. munitions payload of 1800-lb. Additional fuel and bombs could be carried by jettisoning the floats on one-way missions where the pilots and planes were to be expended. detached and wings and tails folded. 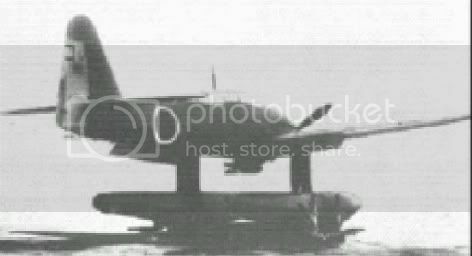 Actually with the stabilizers folded down, and the top of the vertical stabilizer foldedover the overall profile of the aircraft was within the diameter of its propellor. A trained team could rig afloatplane for launch with fuel and armament in as short a time as seven minutes, in fact that trained same trained team could prepare all three planes, and have them in the air under 45 minutes time. The planes were launched from a 120 foot catapult on the deck of the giant submarine. Accommodations for a crew of 145 were designed into the capacious twin hulls, but on most occasions was much higher....somewhere in the 200+ range. The reason for the high number was to facilitate speedy submarine and aviation operations at sea. Eventhough the sub could surface, the trained crew could in fact could break out, assemble, fuel, arm, and catapult all three aircraft..........more men was an “assurance” of that. Washington, or New York. All of these missions were considered by the Tokyo Naval Strategists. Below the hangar in the starboard twin hull was a special compartment equipped to conduct aircraft engine overhaul and test. 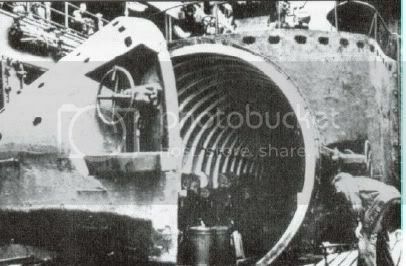 An adjacent magazine stored four aircraft torpedoes, 15 bombs, and gun ammunition; more shells were stored topside in pressure-proof, ready-use lockers handy to the guns. Each of the two engine rooms housed a pair of 1900-hp diesels linked through Vulcan hydraulic couplings to drive the twin propeller shafts. A 1200-hp electric motor generator on each shaft drew electricity form her storage batteries to drive her submerged. With a clean bottom this propulsion plant gave her a top speed of 18.7 knots on the surface and 6.5 knots below snorkel depth. Meals for her oversize crew were prepared in a galley in the starboard hull, where large steam kettles turned out great quantities of rice. 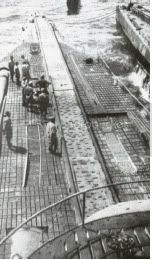 As in all long range submarines, a four month supply of food was stowed in every cranny, including a layer of crates laid out on deck whichthe crew walked on until they’d eaten their way through. Supernumeraries slept on the deck wherever they could find a nook, being used to a floor and tatami mat. Several surviving Japanese submariners have described the hopes that accompanied the completion of the top secret boats in late 1944. As they became available the four giant submarines were assigned to a newly created SubRon One, a ten-bomber strike force. use SubRon One’s ten aircraft to unleash bacteriological warfare on populous areas of the American west coast and Pacific Islands. Infected rats and insects would be dispersed to spread bubonic plague, cholera, dengue fever, typhus and other plagues. General Ishii’s infamous medical laboratory at Harbin, Manchuria, had developed the virulent germ warfare agents and confirmed their lethality by infecting helpless Chinese and Caucasian prisoners. Francisco, Panama, Washington or New York, and decided to launch a surprise air strike against the Panama Canal’s Gatun Locks. Destroying these locks would empty Gatun Lake and block the passage of shipping for months. 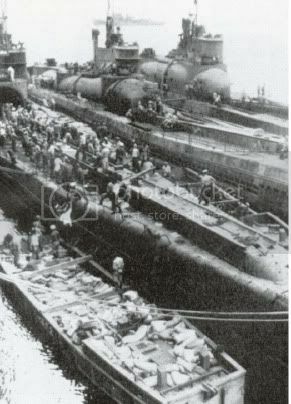 For the 17,000 mile round trip to Panama each submarine needed 1600-tons of diesel fuel, which was unavailable at Jure. I-401 was therefore despatched to Dairen, Manchuria, to bring back the needed oil. On 12 April she grazed a B-29 laid mine off Hime Shima Lighthouse in the Inland Sea and had to return for repairs. In her place I-400 successfully carried out theundersea tanker mission. strikes on a full scale model of the Gatum Locks erected at Tayama Bay. While the submersible carriers were perfecting their tactics to cripple the Panama Canal, the position of the Japanese Navy was steadily deteriorating. attack on distant Panama, which now appeared a questionable diversion. The I subs was ordered to abandon there carefully rehearsed canal strike and attack instead American Naval forces at Ulithi Atoll. tip of Honshu. There she loaded two crated Nakajima C6N2Ayagumo (Colored Cloud) long range reconnaissance aircraft, then sailedinto the Pacificthrough Tsugaru Strait bound for Japan’s island stronghold of Truk. departed Ominato on separate tracks far to the east for a rendezvous at sea southeast of Ulithi in three weeks. Suddenly, on 15 August 1945, Emperor Hirohito broadcast direct from the Imperial Palace this dramatic decree ending hostilities. The I-boats crews were thunderstruck; their combat careers ended just as they reached the attack rendezvous. After a council of war meet, the shattered ComSubRon One reluctantly carried out Tokyo’s orders to cease hostilities, hoist a black flag, and return on the surfaceto home port. The captains of the I-boats were ordered to jettison all documents and munitions, fire all torpedoes, and catapult all aircraft into the sea. When I-401 surrendered to an American destroyer, the U.S. Crew was astounded at its size. The commander of the submarine fleet, Captain Ariizumi, apparently decided on suicide rather than surrender to the Americans. He requested that his body we wrapped in the Japanese flag and buried at sea and shot himself. His body was never presented as proof of his death. Retto, were packed with charges of C-2 explosive and destroyed. They are today at a depth of 200 meters. Four remaining submarines (I-400, I-401, I-201 and I-203 which achieved speeds double those of American submarines), were sailed to Hawaii by U.S. Navy technicians for further inspection. Upon completion of the inspections, the submarines were scuttled in the waters off Kalaeloa near Oahu in Hawaii by torpedoes from American submarine USS Cabezon on May 31,1946. The reason for the scuttling is apparently that Russian scientists were again demanding access to the submarines. The wreckage of I-401 was re-discovered by the Pisces submarines deep-sea submarines of the Hawaii Undersea Research Laboratory in March 2005 at a depth of 820 meters. Bought to you after a lot of work converting it from a PPL slide show by Aviator.